Ever since I've owned my diesel Caddy, I really wished it had a tachometer. The one option that is available on later model VW diesels is the "W-terminal" alternator. This alternator has an extra terminal (labeled "W") that allows an RPM-proportional signal that can drive a dash-mounted tachometer. 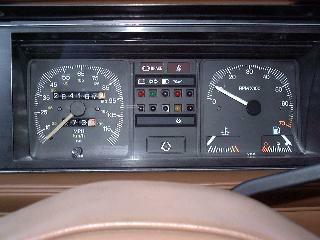 It is common on the turbo diesel models and requires a full gauge cluster swap to have the tach replace the stock clock. 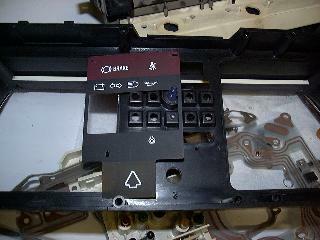 The "W-terminal" also is used to drive the "upshift" indicator that is apparently used on certain '82 and later models. Unfortunately, my original '81 alternator is not the "W" type and it is still working fine, so I don't really want to replace it, same with the instrument cluster. The alternator is driven off the engine by a v-belt, so the readings provided by the tachometer are probably not really accurate. In any event it would have to be calibrated in some manner (I guess by a mechanical tach?). So, I decided it was best to design a fully digital tachometer system to avoid all these problems. One of my old engineering projects I worked on at NASA involved using optical shaft encoders to pick up shaft speed and rotation for use in position sensors. These encoders use a series of concentric circles of alternating light and dark marks to detect motion. For speed only, one set of marks is sufficient. 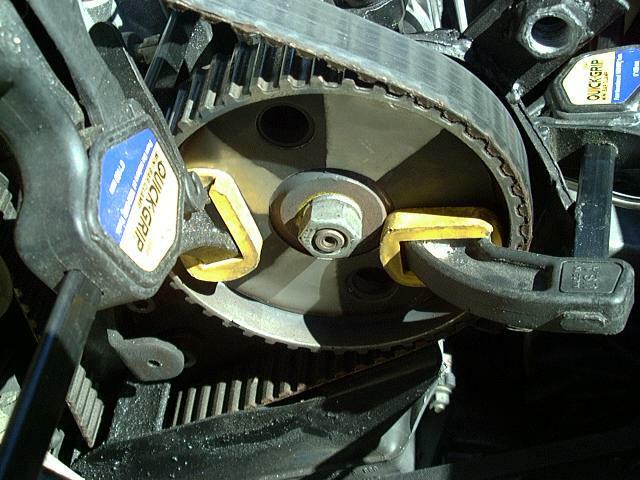 In the case of the VW diesel, the injector pump and cam shaft are driven by a toothed belt off the crankshaft. The crank shaft sprocket is 1/2 the diameter of the rest of the sprockets, so they spin at 1/2 the engine RPM. The crankshaft sprocket is not easy to get to, but the one on the fuel injector pump is accessible by an existing hole in the timing belt cover, at least on my A1/1.6D engine. Since the injector pump sprocket is turning 1/2 speed of the engine, it is necessary to have the pickup wheel make two on-off cycles per revolution. I fabricated the pickup wheel from a sheet of stainless steel sheet metal. I sized it to fit inside the sprocket on the fuel injection pump, this made the outer diameter 118mm with a 43mm hole cut out of the center. I masked off two opposite quadrants and spray painted the remainder with flat black enamel paint. 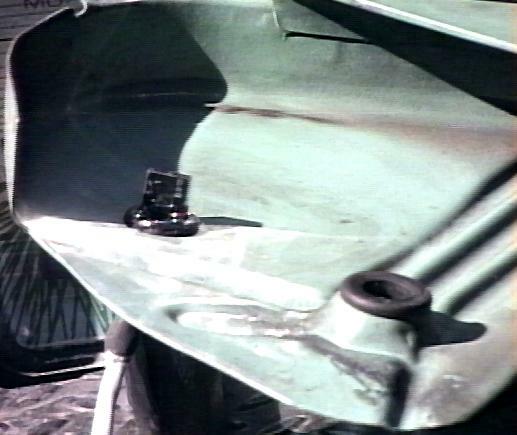 The wheel is attached to the sprocket on the fuel injection pump with a flexible adhesive. 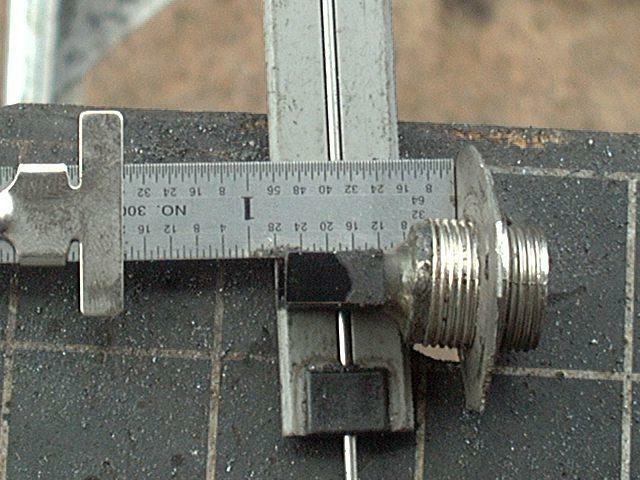 In the above picture, you can see one black (non-reflective) quadrant just below and to the left of the retaining nut on the injection pump pulley. 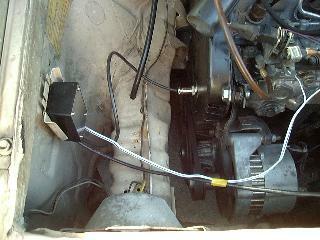 The two reflective quadrants are visible just under the A/C hose that runs across the middle of the picture. Conveniently, there is a rubber plug in the timing belt cover at just the right place to allow the photo-sensor to "look at" the bottom of the injector pump sprocket. I trimmed the mounting tabs on the sensor until it was 3-5mm away from the surface of the pickup wheel. I cut the center of the plug and then glued the sensor into the plug. 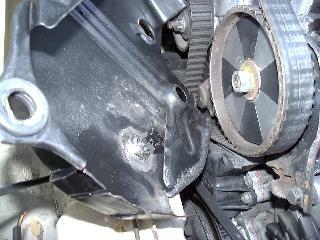 The entire plug/sensor may easily be removed from the timing belt cover if needed. Once the sensor was in place, I created a mounting hole for the digital meter in the dash. 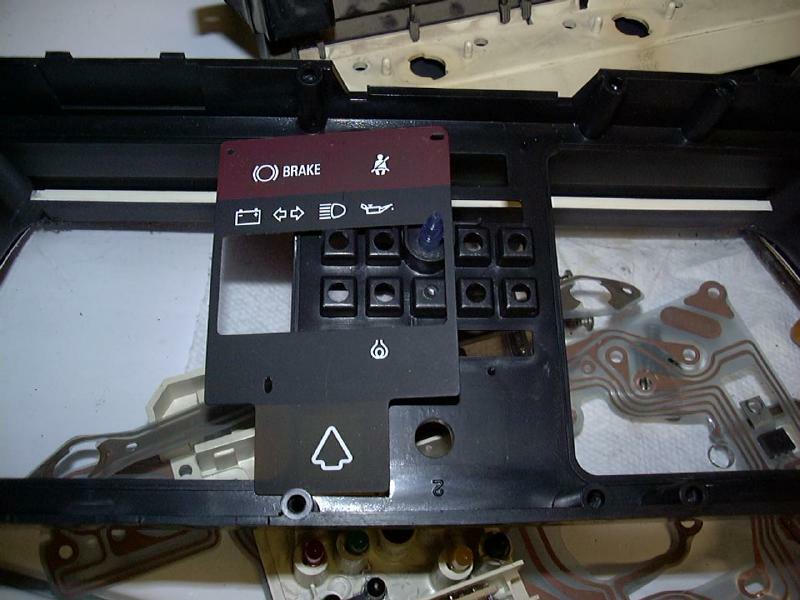 To the left is the stock emergency flasher switch, to the right is the fog light switch I added. I may end up tilting the display upwards a bit for better visibility. Here, you can see it registering 779 RPM at idle. The nice thing about this digital tach setup is that it is precise and no calibration is required, the accuracy is built into the design. This tachometer also reads out to the individual RPM, not just 100's like run-of-the-mill digital tachs. The wiring for this design turned out to be deceptively simple. The photosensor has 4 terminals, and they were different than the Omron data book I had. The book describes them a Anode, K(c)athode, Emitter, and Collector, but the sensor had +,-,L and Out. After some trial and error, I found that the internal LED was connected internally to the + terminal and I had to add a current-limiting resistor between the L and - terminals. I used a 620 ohm resistor which limits the current to about 25mA. Likewise, the Out terminal is an open collector output and by tying it to + through a load resistor (620 ohms) gave me a nice 0-12V swing on the output and again about 25mA of current. I soldered the resistors directly to the terminals on the sensor, then ran 3 wires for +12V, ground and output through the firewall to the panel meter. I spliced into the radio power for +12V and ground (switched w/ ignition) and hooked the power and signal to the meter. 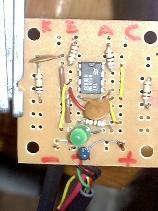 I used 1/2 watt resistors for this application, and selected a value to limit the current to above value. From the photosensor data sheet, resistance values up to about 1K ohms should produce acceptable current values, don't go any lower than 600 ohms, though. Basically, you are looking for a device that will turn on and off with either a change in reflectivity or by physically interrupting the optical path with some sort of slotted wheel. Usually, this consists of a light emitting diode (LED) that provides the illumination, and a phototransistor that senses the presence or absence of that illumination, To avoid problems with stray light sources, infrared is preferred over visible light, and the sensitivity or the photo transistor should be closely matched to the output of the LED. LEDs tend to have a rather narrow output wavelength and also beam width (think of them as tiny lasers), It is important to collect and focus the light out of the source, onto the target and then back to the sensor. While it is possible to make your own photo-sensor, I felt for $12 (actually only $8.50 when I bought mine) my time was better spent on the rest of the system than fooling with more discrete components, etc. A key feature of these optical sensors is the use of infrared LEDs and photo transistors. This both prevents interference from stray external light sources and by having the two components match for a specific frequency of radiation, they are even more immune to interference. Because of this, you won't see any visible light coming from the LED when its operating. After designing and installing the digital tachometer described above, and publishing this project on the world wide web, I had a few readers ask about applying this design to an analog tachometer. In order to see what changes are required for an analog tachometer, it is necessary to understand a bit about how they work and compare that to how the digital tachometer (or more correctly rate meter) that I already had works. Any rate meter simply measures the rate at which some event occurs. Usually this is done by counting the events (contact closures, electrical pulses, etc.) for a given period of time (known as the integration interval) and then simply dividing the number of events by the time to get a rate. In my case, I had a rate of 1 pulse per engine revolution and by using a rate meter calibrated in events per minute, I could display revolutions per minute. After market tachometers are often equipped with a selector switch on the back to choose 4-6-8 cylinder operation. This simply scales the input based upon the above formula. So, in a typical 4-cylinder VW gasoline engine, you'll have 2 ignition pulses per revolution. So the first modification to my digital tachometer circuit is to up the input pulse rate from 1 to 2 (or more) pulses per revolution. Unlike the digital rate meter described above, the analog tachometer is usually built up out of an electro-mechanical current meter and some sort of input conditioning circuitry. Instead of integrating the input signal over discrete time intervals, the mass of the meter movement itself is used to continuously integrate the input pulses. Thus, if the meter takes 10mA to swing full scale, if you were to switch the current between 0 and 10mA at a fast enough rate, the meter needle would read out the average of the on and off cycles. In order for this to work, it is necessary to condition the input signal to provide a repeatable output signal given an possibly varying input signal. The input circuity is used to send calibrated pulses to the meter, usually done with what is known as a one-shot timer. For purposes of discussion, assume the one-shot timer send out a 1mS wide pulse for every input pulse (of varying duration) and the current is calibrated to the 10mA needed by the meter. If the input pulses come at the rate of 10/second (or every 100 mS), the meter will "see" an average current of 1/100 * 10mA or 1% of full scale. If the input speed is upped to 200/second (5mS), then the meter will "see" 1/5 * 10mA or 20% of full scale. Upping the input frequency to 1000/sec will give a full 100% reading on the meter. However, I'm not very interested in designing a tachometer from scratch (been there, done that, bought the T-shirt) I just want design a circuit to drive one. One subtle and not so obvious difference between a digital rate meter and an analog tachometer is in the input. Since the tachometer is designed to be driven off of the ignition primary of the engine, it has a very strong input signal (i.e. low impedance) and the load of the tachometer on the ignition is trivial. A digital rate meter on the other hand is most likely designed to operate with high impedance signals and thus probably has a suitably high input impedance (10 MOhms is typical). So, simply hooking up the output of a photo sensor to any run of the mill automotive tachometer may not be successful. In my case, I was originally using an internally amplified photo sensor and while it easily drove my digital rate meter, it had some trouble with the large tuneup tachometer I had at home. The tach would invariable read about 2/3 the value of the digital meter. It turns out the relatively low input impedance of the analog tach was dragging down the output of the sensor, which caused the RPM reading to fall. While I was only operating the photo sensor at about 1/2 its rated current and probably could have pushed it a bit harder, I felt that design was too marginal for comfort, possibly shortening the life of the component in the elevated temperatures under the hood. This readout module is not back-lit, making it invisible in the dark, I could not find a good way to backlight the display. Anyway, to accommodate an analog tachometer, designed to operate off a 4-cylinder gasoline engine ignition system, a very simple change is required. By simply laying out 4 dark and 4 light segments (instead of 2) you'll make a wheel that produces 2 on-off cycles per revolution, exactly duplicating a 4-cylinder spark ignition engine. That's the easy part. If you are lucky, and have a good high impedance analog tachometer, you might be able to construct a circuit as shown below and have it work. Note the use of the amplified EE-SB5V photo sensor. Dropping the values of the two resistors to about 500 ohms would push the input and output currents up and hopefully drive a decent tachometer. Here's a typical schematic of how such an EE-SB5V setup might look. The resistor on the EE-SB5 LED is sized to provide between 20 and 50 mA (max.) to the sensor, I chose 620 ohms, since I had one in my parts drawer. Transistors are essentially current amplifiers, in this case, the input current is due to infrared photons from the LED hitting the exposed base of the transistor, knocking electrons free, which creates the current flow; in this case I was seeing perhaps 0.35mA flow, so 33K resistance gives about a 12V signal. This extra loading (when compared to a 10 Mohm digital meter) is enough to pull the output signal down next to 0. So, the solution was to add a second stage of current gain similar to the EE-SB5V, but at less cost and without adding it in the sensor itself. So, I returned to another old design solution and the venerable 555 timer. You'll notice it is the same chip used in the previous analog tachometer circuit, but in this case I have it wired up as a Schmitt trigger to both clean and boost the signal up into the 100mA range. Adding this additional circuitry requires the addition of a small electronics box to the system, but this box will provide a nice place to connect things up at. The bipolar Schmitt trigger can drive about 200mA loads and has no trouble with the large shop tachometer I'm testing with. The signal is a nice clean square wave and seems to work at both the lower and upper RPM ranges. And this circuit allows an un-altered analog tachometer off of a gasoline (spark ignition) engine to work off of a diesel engine. A number of these tachometer drive kits have been successfully adapted to work on other than VW diesel vehicles. Among those applications have been on vehicles converted to electiric operation and to marine and stationary diesel engine applications. All those applications are similar in that there is no ignition type signal available to drive the tachometer. As far as the tachometer signal generator is concerned, it does not care what sort of moving equipment it is connected to. If it rotates, it can generate a signal proporional to the RPM and feed that to drive an analog tachometer. In these applications, a custom pickup wheel and sensor mounting bracket would of course need to be fabricated by the end user. Since there is enough interest in this circuit, I am offering this as a simple bolt-on kit (actually no bolts would even be required). 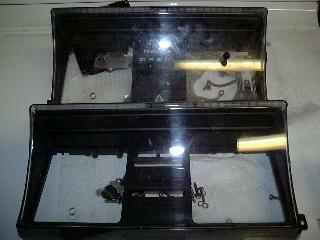 Either of the above two kits are available w/o the reflective pickup wheel for US$5.00 less for custom applications. Custom (non-VW) applications available, contact me with your specifications. One problem with replacing the clock with a tachometer is that you lose the clock. For adhesive, we use "Automotive Goop" or a good high temperature, oil-resistance silicone adhesive-sealant or something like JB Weld will work as well. Note that these photos are of the prototype pickup wheel. 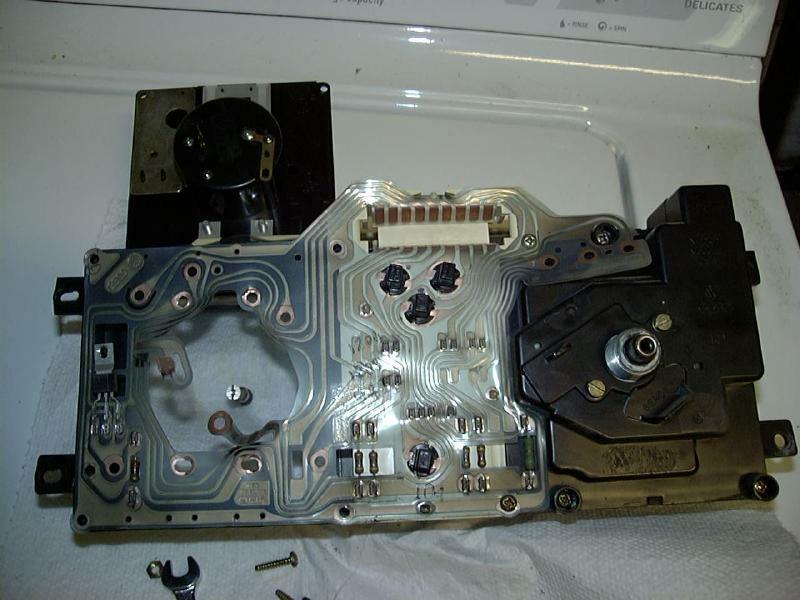 The current production model has 3 holes in it to allow insertion of the pump timing lock tool and to access the lower pump retaining nut and bolt for timing adjustments. So you should be sure and align the holes in the pickup wheel with those holes in the sprocket. 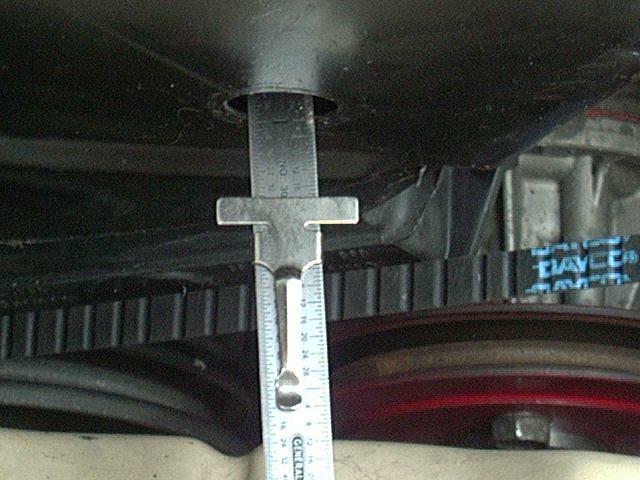 This applies to the Volkswage A1 diesel engines, some later models may require the drilling of a 5/8"/16mm hole over the injector pump sprocket, roughly over the center of the spokes. 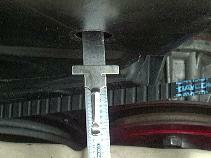 Check the clearance between the pickup wheel and sensor, ideal clearance is approx. 5mm. The difference should be 1/8" to 1/4"
If needed, you can also bend out the face of the timing belt cover for more space. 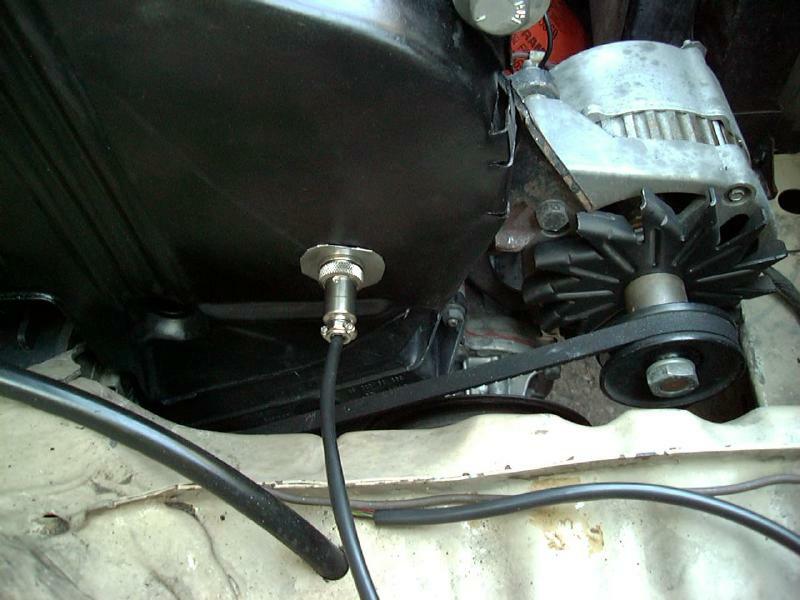 Note that the old style pickup wheel design is shown in this image, the new version has holes to allow for locking the pump sprocket in place for timing as well as an access hole for the lower pump mounting bolt, click here for an image of that new design part. When installing the new wheel, be sure to align the two full holes with the alignment holes in the sprocket. And most importantly, BE SURE THE BELT COVER IS SECURE, make sure all the bolts and spacers are in place and tight before starting the engine and driving. You do not want the cover to come loose while driving as it or one of the mounting bolts can easliy come loose and damage the timing belt. Connect the +12V supply wire to the fuel cutoff solenoid valve on the injector pump (blue crimp-on connector just visible in lower center of image) and connect the ground wire to a suitable ground point, I used one of the bolts that attach the throttle cable bracket to the pump. You may want to add an in-line fuse for the power line of 1/2 to 1 amp. Also, be sure you have a clean power source, should have no glitches (if so, consider adding a noise filtering capacitor of a few uF) and be sure the voltage is no higher than about 13 volts. Sometimes when alternator regulators start to fail, they can put out very high charging voltages (14 volts or higher) and this will damage the IC in the signal generator box and it will also kill your battery in short order. Find a suitable mounting location for the electronics module; the passenger fender wall is usually available, I had an un-used bracket on the fender wall. Be sure to mount the electronics box in an area where it will be protected from water and also make sure to either seal it up water tight (with silicone sealant) or mount it with the wires downward so any water that might get into the box will drain out. This wire supplied without connectors to allow passage through the firewall. 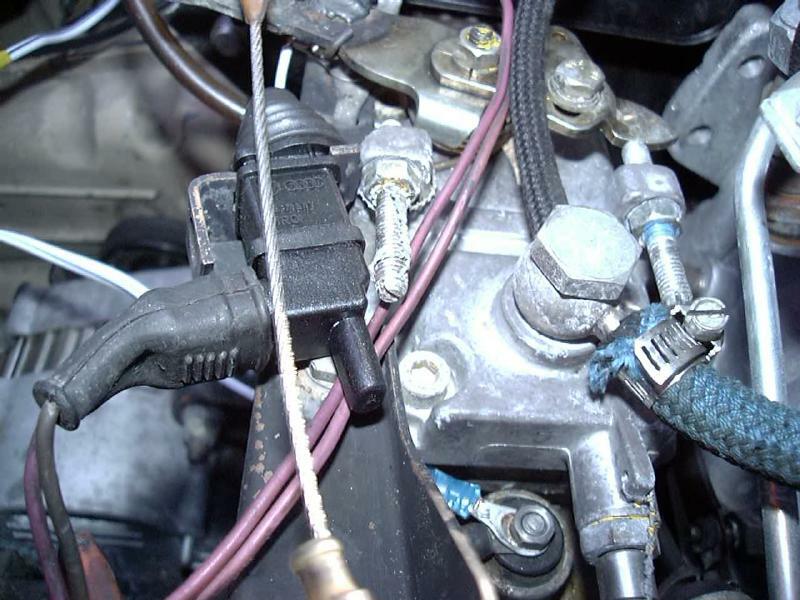 If you do not use or have an "upshift" light and/or an RPM-sensitive oil pressure indicator (such as on the A2s) then another connection option is to remove the wire from the "W terminal" on the alternator and connect the green wire from the tach generator box and you are done. That signal is wired back to the tach input wre on the factory cluster. If not used, wrap this wire in tape to keep it from shorting something else out. If not used, wrap this wire in tape to keep it from shorting out. The LED will flash in time to the engine revolutions, you should see about 25-30 flashes per second at idle. Assuming your tachometer has not been modified, the system should need no calibration. I found on mine, the needle was pointing about 30° below the "0" mark, so I had to pull the needle off and carefully reposition it to point to "0" at 0 RPM, I'm not sure why my needle was off like this. After a year or so of use, you may notice the tachometer needle start to jump a bit at higher RPMs. If this happens, remove the timing belt cover and clean the face of the optical sensor. Its infrared optics are fairly tolerant of dirt, but if it gets very dirty it loses sensitivity and high response speed. Use a water-based window cleaner and soft rag to clean it. After a few years of use, I found a totally unexpected benefit of this tachometer design. I decided to install a cruise control on my VW diesel and guess what, it needs an engine RPM signal to operate - BINGO! The first is to locate a VW diesel with the real diesel tachometer that takes its input from the "W" terminal on the alternator and use that (this assumes you have an alternator with a "W" terminal). Most commonly found on the Jetta turbo diesel models. Another tachometer option is to use a VW gas tachometer and the proper alternator, i.e. one with the"W" terminal, and modify the tachometer as described here. Here is a copy of the old writeup that was passed on to me by the author, Mike Musick, and is available here, although the information has not been verified and some folks have reported difficulties getting the modified tachometer to work properly following these instructions. There is a company that sells either convertor kits for the W-terminal or a flywheel pickup unit to drive a gas tachometer (model DSL-1). Apparently this kit does not work properly with at least the A2 gas tachometers due to input signal differences. Or, you can use the previously described analog tachometer circuit to drive the un-modified gas tachometer and avoid the calibration hassles. So, your first step is to locate a suitable tachometer to use for the conversion. It is best to obtain an entire instrument cluster if possible. They can often be found on eBay. For an A1/Mk1 VW, use one from from an '84 GTi model. For other model VWs, you would want to use one from a similar model to ensure proper fitment in the in-dash instrument cluster and for other makes of vehicles, find a compatible model vehicle to obtain a tachometer from. Other applications are for vehicles which have been converted from gasoline to diesel engines and even for vehicles converted to for example electric drive. Disassemble the cluster by removing the lamps (save them for spares) and then the flexible circuit board. Remove the tachometer and the fuel and water temp gauges that go with it. One advantage of the getting the entire cluster is that you get a new housing without the hole drilled to access the analog clock stem. Another advantage is that you are getting a whole boat load of spare parts, light bulbs, odometer gears, etc. - Then if the cluster won't come out easily, some trimming of the back opening of the dash cutout can make it much easier. 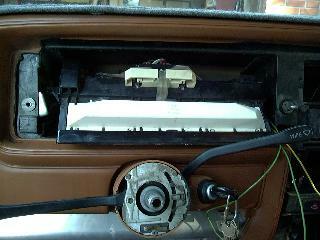 My '82 came out very easy, but my '81 had a lot of flashing left from the molding process and I had to trim the opening a fair amount to get it out (none of the trimming is visible with the cluster in place). In any event, you'll probably want to use your old speedometer, the old wiring and replace the clock side of things with the tachometer. The fuel and water temp gauges may be located differently, but should still work. The only modification needed is to carefully trim back the "tachometer" "W-terminal" connection from the tach, tape it off then connect a separate wire to the terminal on the tach which in turn gets connected to the tachometer pickup signal. Note: For those who are curious, I stuck an oscilloscope on the "W-terminal" and found that it delivers a fairly decent square wave signal, 0-12V or so, at about 25 pulses/revolution. This is an approximate value as I also had my accurate optical signal on the second channel and noticed the "W" signal was not locked to the accurate signal. If you connect it to the gas tachometer, you'll get abnormally high RPM readings, I saw about 4-5000 RPM at idle. But this is a good way to test if your gas tachometer is working. The red circle is around the clock's constant 12 volt power connection, this is not used with the tachometer, it uses switched power so it turns off when the engine is off. 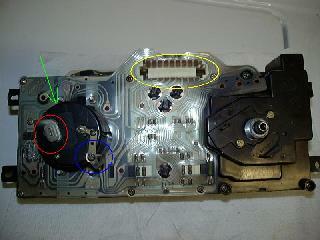 The yellow oval is around the area where the cluster wiring plug mates with the cluster to bring in all the various signals and voltages to the cluster. 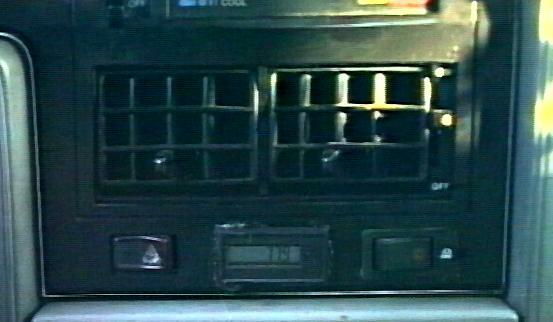 So power for the tachometer as well as the W-terminal signal from the alternator (if factory installed) comes in via this connector. 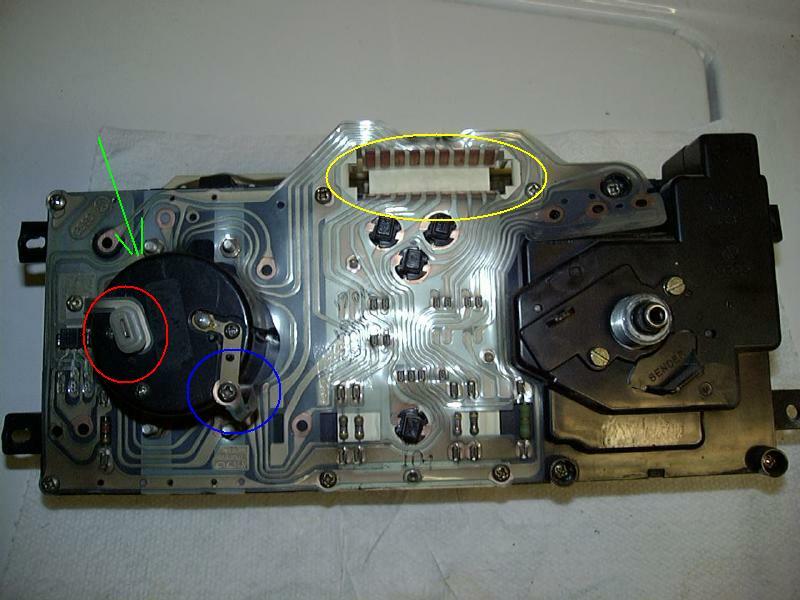 Install the gas tach and the diesel flexible circuit, then carefully trim the mylar material back from the stock "tachometer" connection, tape it off to prevent a short circuit, then connect the new wire (green in this picture) to the tachometer "B" terminal (circled in green). 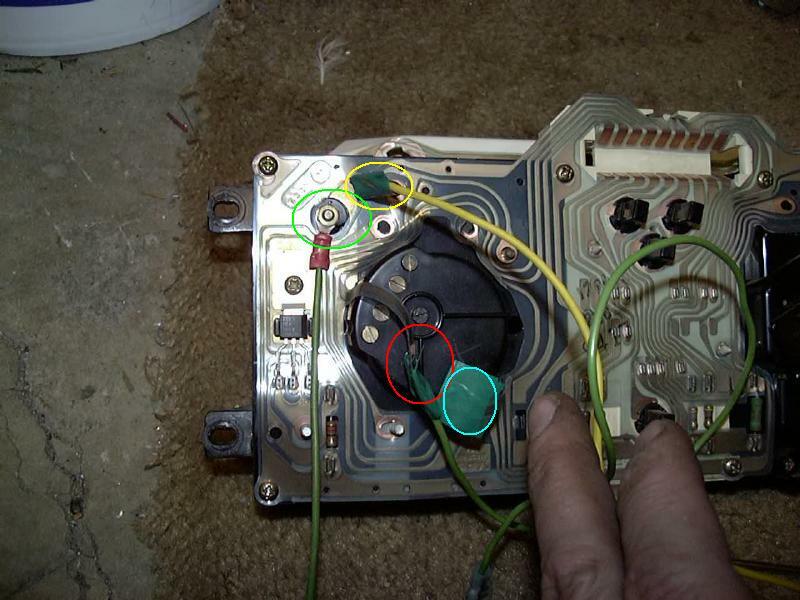 Note: As pictured, I connected wires to the stock "W-terminal" (yellow wire - yellow circle) and the clock's +12V circuit (the other green wire - red circle) for conducting some experiments. Simply wrapping the contact in electrical tape is sufficient as shown in the light blue circle). So what functions did I use the old W-terminal and clock 12 volt connections for? Well, I used the W-terminal signal to determine the relative frequency of the W-terminal pulses vs. the ones from the tachometer signal generator as noted just above the photos in this section. And the clock power? Well, I used it to supply power to the 2" round VDO clock I put in a center console. Instead of reinventing the constant 12 volt clock power signal, I merely used what was on the back of the cluster to feed the new clock. Obviously, you don't need to do this unless you also have plans for those signals. If not needed, simply wrap those circuit ends in electrical tape to prevent an accidental short circuit and push them out of the way. Once everything is back together, slip the cluster back into the dash and re-install the fasteners. Start the engine and check to see if everything is working. You'll notice I swapped to the GTi speedometer/odometer, since my old diesel odometer basically fell apart in my hand when I took it out. I tried repairing the broken drive gear, but the plastic frame was cracked where the gear that connects the trip meter and odometer was and it fell out. I did take care to set the GTi odometer to the same mileage as my old odometer (and I'll keep it around for backup). I figure I added 30MPH to my vehicles top speed, too, instead of the meager 90MPH top end, I now have 120! You can follow the above proceedure to swap a tachometer for a clock in a gas engined VW as well. Just ignore all the wiring changes I had to do for the diesel conversion. Also if you are swapping a diesel tach into a diesel cluster, then again, you don't have to make any wiring changes, either, since the W-terminal RPM signal is already present at the tachometer. Its only when swapping a gas tach into a diesel that you need to connect the RPM signal generator output to the tachometer input. 620ohms will give maximum current to the LED. If you have a very high heat environment, you might chose a lower LED current as set by the 750ohm resistor. Other options are to paint bright/dark strips on a sprocket/pulley/flywheel, etc. If you purchased the parts kit, you'll need to assemble and test the electronics module. There are two different types of PC boards used, depending on availability. First, start by placing the 555 timer chip in the center of the printed circuit board. May have a notch on the top side or a mark of sorts for the #1 or #2 pin, depending on the part mfg. Then, run a bare power wire up the #8 pin side of the board and bare ground wire up the #1 pin side. Then insert all the discrete components as desired, arranging them to end up in the hole next to where they will terminate. Note the above photo includes the optional diagnostic LED (green device) and the blue bypass capacitor (optional, use ~1uF tanatlum capacitor if desired) at the bottom center. In the photo below, the jumper is on the under side of the PCB, and not visible. If you want to place that jumper wire on top of the 555 along with the other wires, feel free to do so. Arrange the parts so the opto-sensor wire will come into the top of the circuit board, the power and tachometer signal goes out the bottom. It makes no difference which side of the opto sensor LED that the resistor goes on, it'll work exactly the same between power and the LED or between the LED and ground. So choose the side that results in the cleanest installation. Solder all the components, including the 5 jumper wires to power and ground as needed. Solder the opto-sensor to the short end of the 4-wire connector, trimming it to is sits as close as possible to the end of the connector, too long and it'll rub on the pickup wheel. We find that connecting the Collector to pin 1, Kathode to pin 2, Anode to pin 3 and Emitter to pin 4 works well. We use pin 1 = black, pin 2 = red, pin 3 = yellow, pin 4 = green. 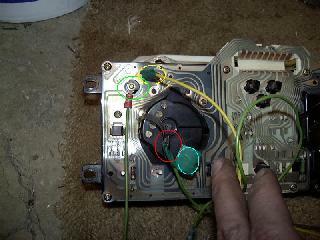 Solder the long wire to power (red), ground (black), and tachometer signal (green) and run it out of the box. 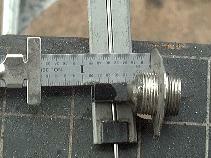 If desired the 2-conductor wire can be hooked to power and ground. 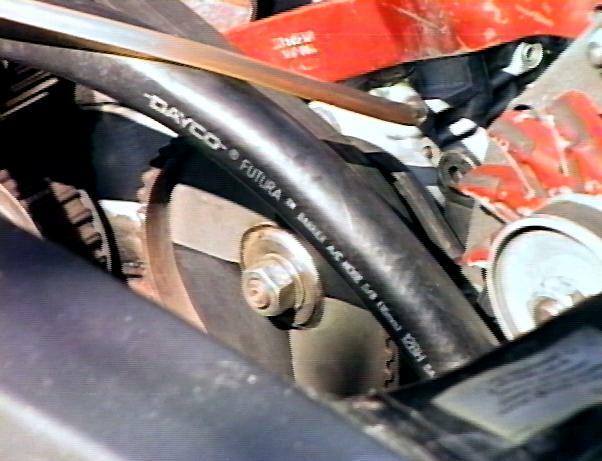 It is handy to connect to power and ground at the fuel cutoff solenoid on the injector pump. Otherwise, run power and ground in on the long wire from the dash. Alternately, for aftermarket tachometers, the power and ground from the long cable can be used to power the tachometer. If you find your charging system has a lot of electrical noise and that affects the tachometer display (like the needle jumping around too much), then feel free to add the bypass capacitor as shown. You can get one at most electronics stores. Once everything is connected, its time to test the circuit. First apply 12V and a ground connection to the circuit. For testing, I use a top from a tin can, painted half in flat black and chuck it up in a cordless drill to serve and a signal source for testing the circuit. The circuit has built-in high pass filter to clean up in low level input signal. It therefore won't respond to static on/off type signals. You may be able to use a shiny piece of metal, like the top of the electronics box, to generate a signal by rapidly moving the sensor on and off the metal. The cutoff frequency is around 500 RPM (1000 pulses/minute) so the input needs to be pretty fast to make it past the filter. My cordless drill only runs up to around 350 RPM, so I made the test wheel with 4 pulses per rev, which will "trick" the circuit into seeing twice the RPM. If the LED blinks with an input signal, you are set, it works! Check all the power and ground connections. Check the pin 2-6 connection, it should be 1/2 the input voltage, if not, check all the connections to pins 2 and 6, there are a few. Check the Emitter (E) output of the opto-sensor before the 0.01 uF capacitor. It should swing nearly from 0V to 12V as the sensor moves from shiny to dark. This input will respond to static light and dark signals, it is before the filtering 0.01 uF capacitor. If not, check all the inputs to the sensor. There should be about a 12V drop across the resistor on the LED part of the opto sensor. If no drop is observed across this resistor, there is no current in the LED so the photo transistor won't be getting any signal. While I usually pot the opto sensor legs to the connector shell, don't do so before you are 100% sure its working. If all these tests fail, double check all the components and solder connections. Check all the 555 pins, make sure the power pins have power, the ground pins are at ground and the input pins (2 and 6) are at 1/2 the supply voltage. If it all looks good, most likely the 555 timer has been damaged. Normal current draw is about 30mA, but if the 555 is dead, you'll only see about 20mA current which is what the opto-sensor pulls. If you want the LED to be visible, drill a hole for it in the box lid, install the circuit board and top and once its all working, apply some clear silicone sealant to the lid, LED and where the wires enter the box.